Centuries ago the forces of Hell learned that just because they’re made of pure, elemental evil doesn’t mean they’re immune to artillery fire. Since then, the world has been learning that just because you defeat the forces of Hell doesn’t mean you’re immune to the threat of evil. 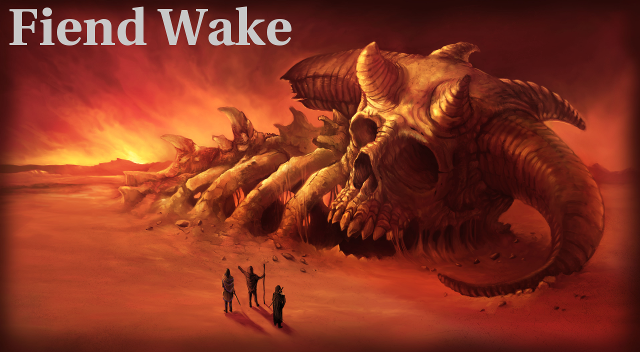 Fiend Wake is a role-playing game that is not for wusses. It boasts a rich, mechanical experience to support its heavy emphasis on story-telling in the aftermath of an apocalyptic demon war. As the nations of the world claw their way out of desolation and squalor, they’ve become accustomed to the constant threat of extinction — so much so that they may not notice if the jeopardy became more immanent. Play as a dwarf, elf or human from one of the nine nations that survived Hell’s invasion. Choose from the dozens of possible character classes in a quick and easy character creation process. Leverage your party’s unique combination of characters to make a powerful, heroic team. The terrifying, unspoken thought that lurks under every conversation and festers behind every smiling face is that the world may never fully recover. After all they’ve been through, people fear they’re poised to obliterate themselves in senseless war.